I really don’t know why it’s taken us so long to take my parents here. 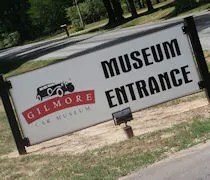 From the first time I visited the Gilmore Car Museum last summer, I knew my dad would love it. My parents came for their monthly visit to see their youngest grand child and I didn’t want to spend the day sitting around the house. I sent an email to my dad Friday night and told him I was planning on taking them to look at classic cars. My dad was on born and my mom would be happy as long as she got to see L and eventually make a stop at Meijer. After breakfast in Hickory Corners, we made the short drive down the road to the Gilmore Car Museum. The sprawling museum campus sits on the corner of Hickory Road and M-43 in Barry County. The story of the museum itself is pretty incredible. 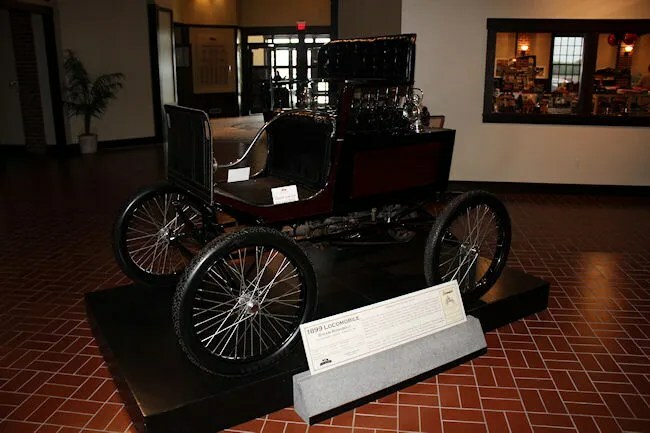 The namesake, Donald Gilmore started his classic car collection with a 1920 Pierce-Arrow restoration project given to him as a present from his wife. 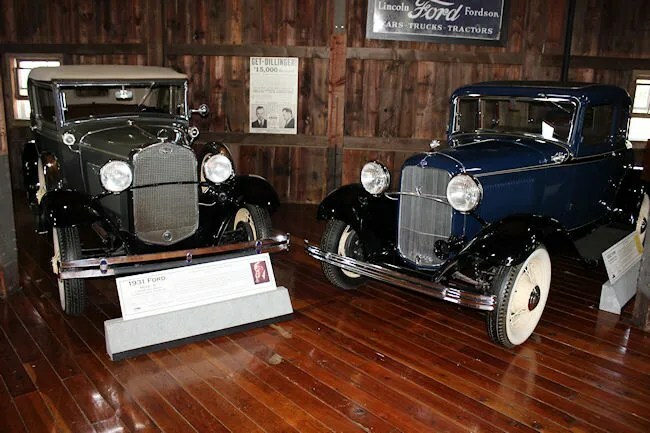 From there, he amassed a collection of 30 cars, bought the farmland that currently houses the museum and started moving barns to the property to display the growing collection. We pulled in to the parking lot right around noon on a Sunday. There were quite a few cars in the new parking area in front of the new entrance building. When I was at the museum last, this building was still under construction. This new building, called the Gilmore Heritage Center is climate controlled and houses the main entrance, a gift shop, a multi-media theater, a research library, and archives in addition to exhibit space. 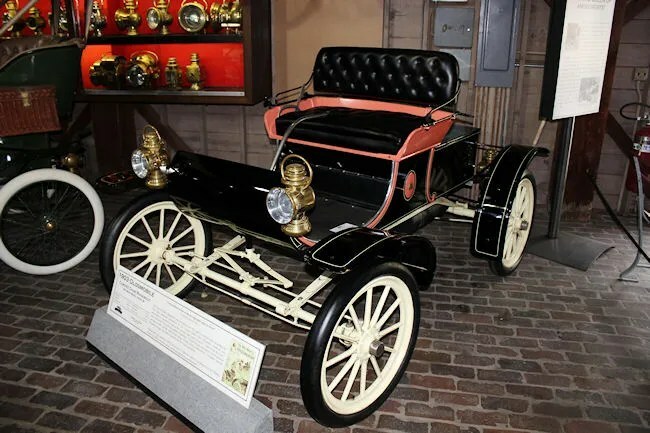 It’s actually connected to the steam barn which houses a collection of cars from the 1890’s-1915. 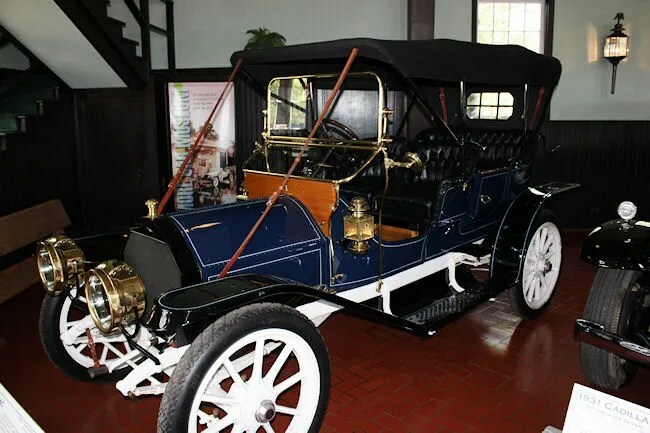 This is also the area where Kalamazoo’s auto history is on display with the Checker Cab Company cars and some early cars from other companies. The Heritage Center is the part of the campus that is open year round and is actually climate controlled. We were a little surprised to find out there was no heating or cooling system in the other barns. The temperature was pushing the mid-90’s on our visit and some of the barns, especially the upstairs, was a little warm. There was a pretty nice breeze though, so it wasn’t nearly as bad as it could have been. Since the Heritage Center had A/C, we decided to come back to that one after we saw everything else. Our first stop took us past George & Sally’s Blue Moon Diner to the Carriage House which houses the Cadillac’s and Lasalle’s. This is where my dad got his first glimpse of what this museum actually had to offer. The beautifully restored cars were behind a velvet rope in an equally beautifully restored barn. 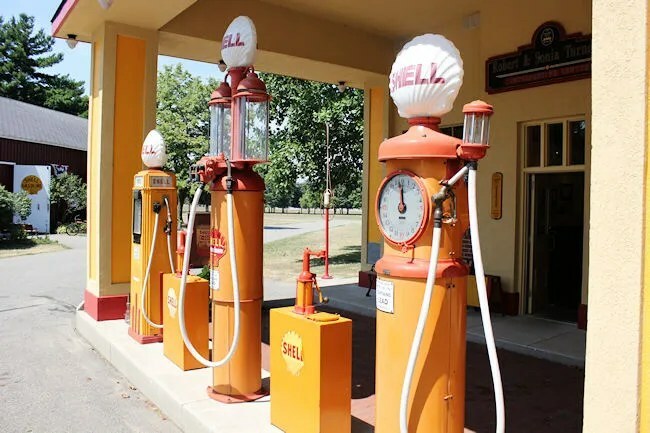 After a quick trip through the Carriage House, we headed over to the Shell Station. Lots in here for both of my parents. We played for quite a while with an old cash register. My mom told us stories about how she used one almost exactly like that working in her parents restaurant growing up. The next stop was the motorcycle barn. 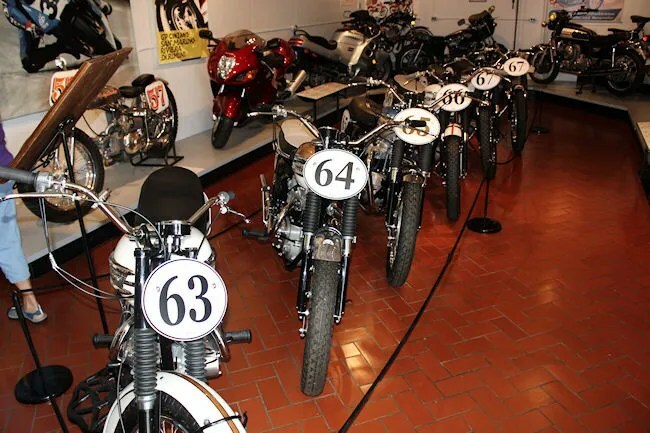 The barn had a number of old Harley-Davidson and Indian bikes as well as some newer foreign models (BMW included) and some historic racing bikes. 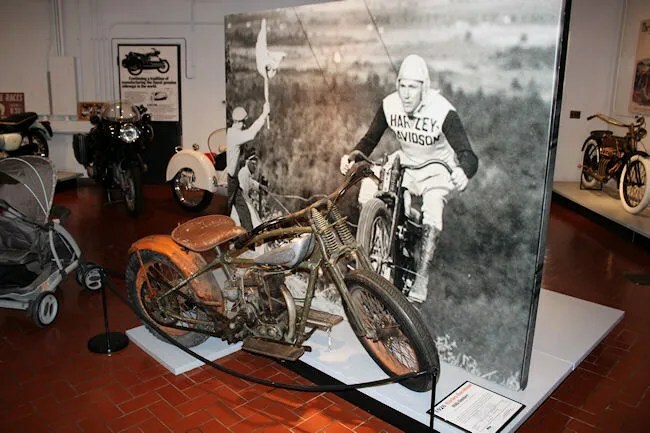 J was amazed by some of the early motorcycles which were nothing more than a bicycle with a motor attached to it. The fourth barn on our tour was the Disney Movie Set/Pedal Car barn. This was another one my mom really enjoyed because she remembered having a car just like a couple on display. This whole collection was donated from a private collector from Allegan after he passed away. The other part of this exhibit is part of a movie set from the Disney movie The Gnome-Mobile. While it’s called one of Disney’s better comedy-fantasy films, I had actually never heard of it. The story is about an executive at a timber trading company who travels to the forest with his grand daughter who finds a gnome looking for other gnomes. In order to film the regular size actors as gnomes, they recreated a 1930 Rolls-Royce Phantom II interior at a much larger scale. That huge car interior is what is on display at Gilmore. Next up was the Campania Barn. This late 1800’s barn has quite a story itself. It was on the farm of a mint farmer in Fennville that sold spearmint and peppermint oil to P. J. Wrigley in Chicago. 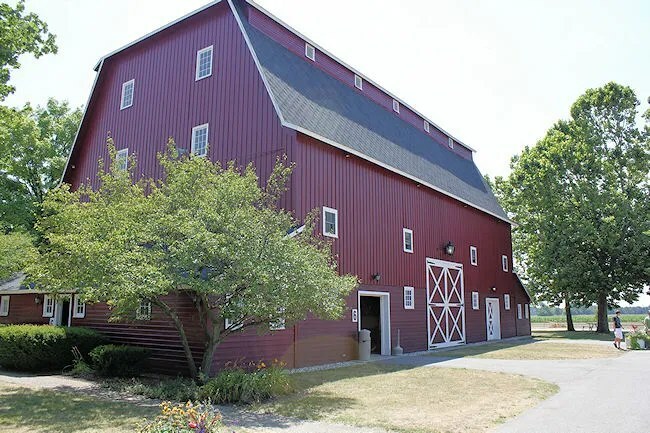 The five story barn is home to The Tucker Historical Collection. The first floor also shares space with other cars of the 1940’s. The upper level features cars of the 1930’s. From there, we went to probably my favorite part of the museum, the Pierce-Arrow Museum. 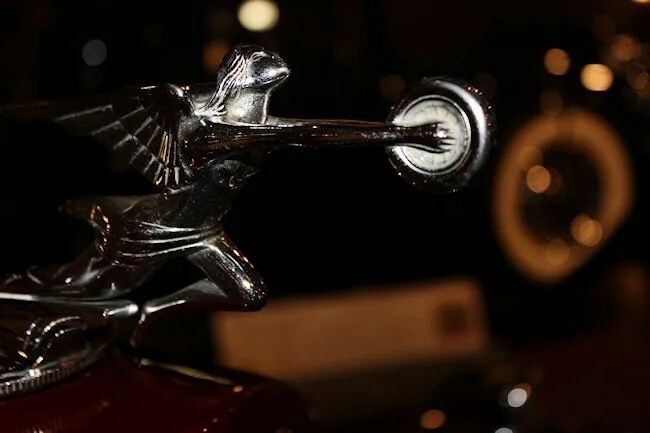 The Pierce-Arrow’s were the luxury cars of the days and the company went in to bankruptcy during the Great Depression because they refused to offer a lower priced car. My absolute favorite car on the entire Gilmore campus is an unrestored 1931 Pierce-Arrow Model 41 Limousine. Only two of these cars were ever made and both were for an “eccentric millionaire” bachelor in Massachusetts. This incredible car shows some wear as the original factory paint is starting to peel, but that just adds to it’s charm. Only three barns left at this point. The next one up was the Classic Car Club of America Museum. 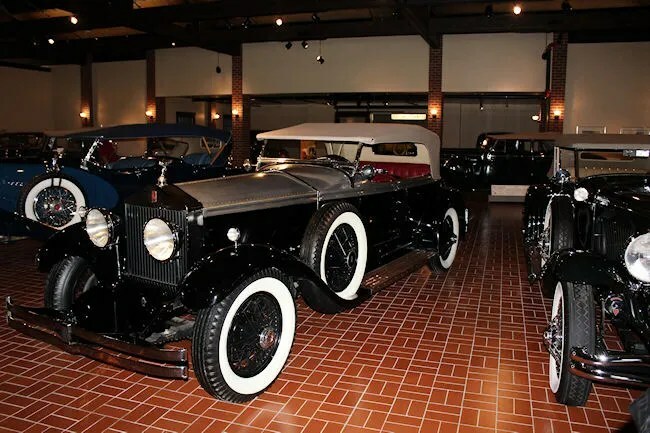 There are several different classic cars in this barn as well as a full collection of “mascots.” The barn itself is named The Barrett Barn after Thomas W. Barrett III, founder of the Barrett Jackson Auction of Scottsdale, AZ. Next stop was a quick one. It’s the scale replica of a small town train station that holds the Automotive Mascot/Hood Ornament collection. The depot is a scale replica of the train/bus depot in Marshall. Last stop was back in the Heritage Center. J took L to go change her diaper only to find a bathroom with no changing table. There wasn’t even really anyplace to set the kid down to change her, so she took the keys from me and headed back to the car to feed and change the baby while we checked out the last display area. 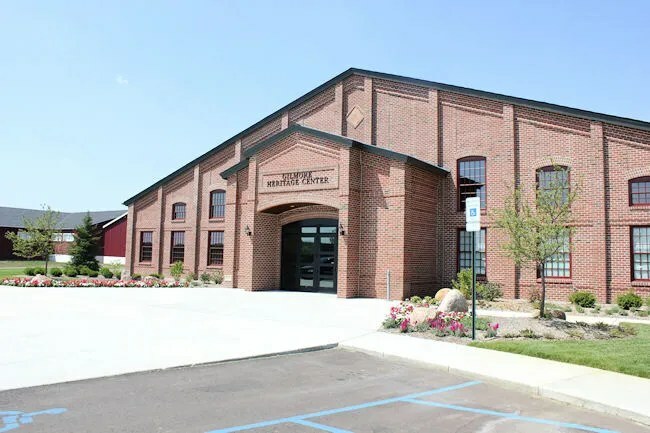 The Heritage Center leads in to the Steam Barn and it’s Annexes. This display area is the largest on the campus. In addition to the classic cars and steam cars, it hosts the muscle car collection and stock car collection. Being race fans, my dad and I spent a little extra time in the stock car area. 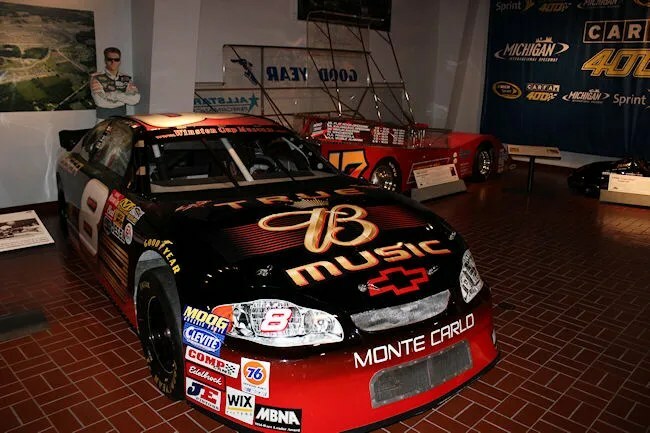 It’s amazing to see how NASCAR has progressed from the days of Ned Jarrett to today. 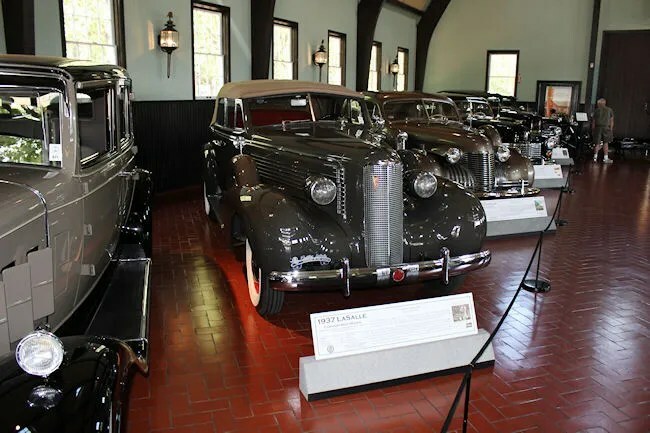 The Gilmore Car Museum is one of Southwest Michigan’s treasures. This place is a classic car lovers dream. I’m not a huge car guy, but I love walking around reading the history of all the immaculately restored cars…some over 100 years old. The Gilmore is a must visit for both locals and tourists.